Preheat the griddle to 350 F.
Mix the dry ingredients together, and then add all the wet ingredients. Mix well. Pour the pancake batter onto the griddle in 1/3 cup portions. 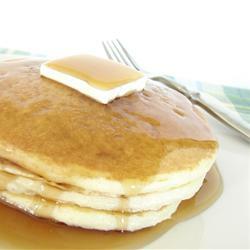 Cook until the bottom is golden brown and then flip the pancake. Repeat.